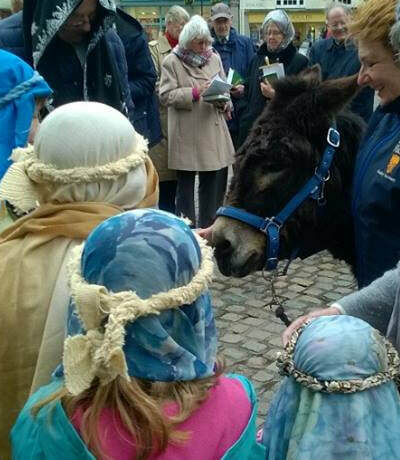 A formerly neglected, rescued donkey from The Flicka Foundation Donkey Sanctuary, found himself at the centre of attention on Sunday (14 April) as he led the Palm Sunday procession at Truro Cathedral. Harry travelled with his carers from the sanctuary near Penryn to lead the congregation in procession around the Cathedral to recall Jesus' entry into Jerusalem. Laurie Stephenson, Director at The Flicka Foundation explained; "This is the second year that Harry has had the honour of taking part in this service, we were delighted to have been invited again. We are so proud of our lovely Harry, he is one of our friendliest donkeys and his manners and behaviour were impeccable. He took all the attention in his stride." Harry had been left, with another donkey called Lettuce, in a paddock with no shelter in the middle of winter when temperatures were 12 below freezing, before being rescued. They are both now well cared for in their home for life at Flicka, where they enjoy the freedom to spend their days as they choose; grazing in the paddocks, relaxing in the sunshine or socialising and pottering around the cosy donkey barn when the weather is colder. The Flicka Foundation Donkey Sanctuary (Charity reg. No. 1153858) was founded by Mary Berryman in 1995, following the rescue of an elderly pony named Mickey. Mary loved all animals with a passion and could not bear animal suffering. Now approaching its 25th anniversary, the charity has rescued and rehabilitated well over 700 animals since its inception. Members of the public are welcome to visit the donkeys all year round.